KunstpodiumT in Tilburg supports emerging artists. It encourages creative experiment, serves as a helpdesk, organises Peer Critiques in the ARTpart project, and hosts Apprentice Master project. The exhibition ‘KunstpodiumT Ontleed’ (‘KunstpodiumT dissected’) is part of the latter. In Apprentice Master an experienced artist works together with artists who have recently graduated from art schools in the Netherlands, Belgium and Nottingham. They collaborate towards a presentation of new works. 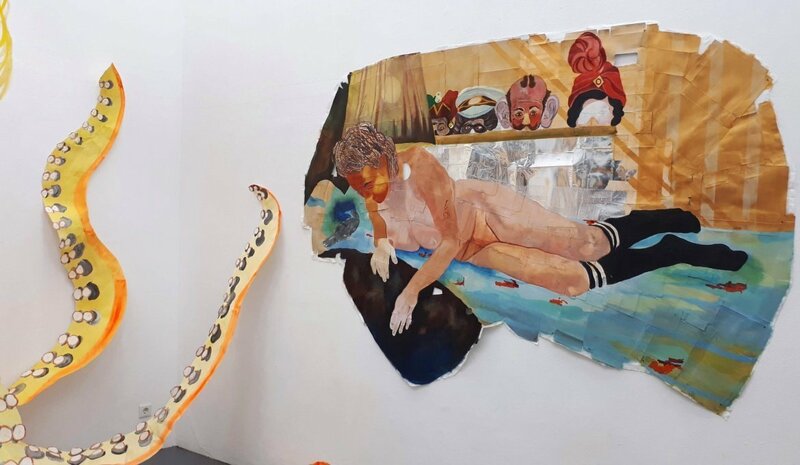 Dutch painter Lotte van Lieshout is the Master for ‘KunstpodiumT Ontleed’. Jochem van den Wijngaard, Nina van Dijk, Marlijn van Zadelhoff and Bente van Olderen are the involved apprentices. The idea for the exhibition ‘KunstpodiumT Ontleed’ sprung from an MRI-scan of Lotte van Lieshout’s brain, taken after her cerebral haemorrhage. Each of the spaces at KunstpodiumT represents a ‘room’ – or, lobe – of the brain, modelled after the MRI-scan. Each lobe in the brain has different dominant functions and is activated by different stimuli. The same goes for the rooms at KunstpodiumT. These express the artists’ inner worlds. By walking through the rooms, the visitor meets different parts of the conscious and unconscious. These can be interpreted as a dream-like unconsciousness by Jochem van den Wijngaard, a mental safe space by Nina van Dijk, emotional regulation by Lotte van Lieshout, memory by Bente Van Olderen, and the relation with nature by Marlijn van Zadelhoff. That is to say, the murals by Jochem van den Wijngaard cover the two walls of a high ceiling room. They invoke a dream world, depicting female figures surrounded by nature. At night, the reflection in the window constitutes an image together with the ivy and other plants outside, perfectly aligning inner and outer world. Nina van Dijk appeals to the safe space of the domestic sphere, through the collection of personal memorabilia and transient found objects. The counterpart between dream and reality is enhanced by Lotte van Lieshout’s powerful expression of difficult times she went through on the one hand. On the other hand, Marlijn van Zadelhoff and Bente van Olderen aim to catch ephemeral moments of, respectively, nature and history. Withering leaves are being kept together with zipper and thread, and faces in historical pictures are scratched out. The exhibition highlights the consciousness of the body and the mind. These concepts are inextricably intertwined. Lotte van Lieshout’s oeuvre is a visualisation of the so-called ‘embodied mind’: the idea that someone’s brain and mind depend on the nature of their body. In other words, mental processes are formed by bodily structures and physical processes. This manifests not only in the sense that Lotte van Lieshout uses her own body as a model, but the way her body has changed also influences her mind. The exhibition fits perfectly in the contemporary debate in both humanities and neuroscience on so-called neuroplasticity, meaning that external stimuli change the structure of the brain. In other words, the brain changes as a result of environmental or social experiences. In ‘KunstpodiumT Ontleed’, the rooms are a metaphor for the brain as a metaphor for the self. Not the self in the Cartesian sense of “I think, therefore I am”, but the self as a continuous process. The physical movement through the rooms, each with a different sensory experience, encourages the visitor to reflect on two things. Firstly, on how the ‘self’ is connected to the bodily experience of the works. Secondly, on how the different parts of this ‘self’ relate to each other and to the world. Master Lotte van Lieshout painted an apparition of herself. The packing cardboards she uses as canvas form the shape of the brain. The portrayed lying figure holds her hands in a black pool that represents the so-called cerebellum. In human functioning, the cerebellum is dominantly associated with balance and coordination. The figure absorbs the black substance as solace and strength. This is precisely what this work radiates. Lotte van Lieshout explains that the inspiration for the work was an experience she had in a hospital elevator: “I saw myself in the reflection, I recognised myself but I had an emotionless expression.” The aluminium tape refers to this mirror. She translates how her physical state is linked with her mental state. In other words, how the mind is embodied. Her other work in the room is an in-situ installation. 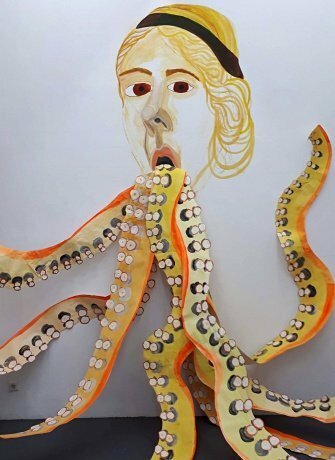 The mural is a self-portrait, reminiscent of Caravaggio’s Medusa, with paper octopus tentacles coming out of the mouth that creep through the space and into the hall. In terms of the colours, she was inspired by murals from Fra Angelico. ‘Impermanence’ is a motif that runs through all works. Jochem van den Wijngaard transformed one room with wall-covering murals in shades of blue. He depicts female figures surrounded by nature, one referencing Henry Fuseli’s The Nightmare (1781) and the other Henri Rousseau’s The Dream (1910). An unintentional overlap with Lotte van Lieshout’s imagery is apparent. Nina van Dijk portrays a type of living room. In the corner a piece of paper rests on a rocking chair. When looking from the right angle, this uncovers a sleeping cat – a fossil alike. 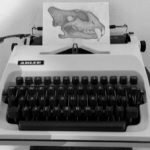 The quite literal interpretation of transitoriness is also apparent in the drawings of pet skulls and bottles with transient natural objects. Marlijn van Zadelhoff lays bare the impermanence of nature. 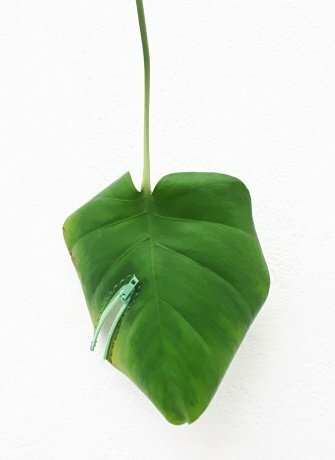 She patches leaves and organises branches, which are decaying during the exposition. Bente van Olderen refers to the inevitable feeling of loss. Her collage of scratched pictures, quotes, and drawings simultaneously grasp and let go of memories. The collage escapes from a red circle. This could represent the feeling that one gets when the past is inevitably escaping the present. In this constellation the artists have made a beautifully composed exhibition. The individual works make the viewer connect to his or her personal inner world. The strongpoint of the exhibition is the result of the physical walk through the rooms. It makes the idea of neuroplasticity tangible. It poetically substantiates that the brain is malleable, and that the self is not a static entity but a continuous process. 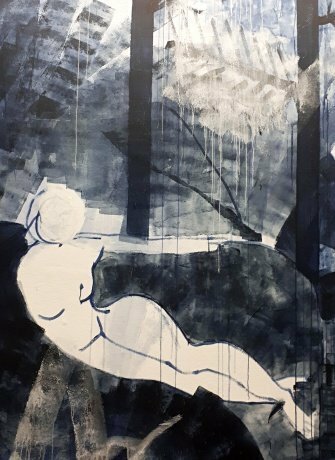 ‘Kunstpodium T Ontleed’ is on show until 7 April 2019.